created in SSIS. This was because there was no way to do this. your unit tests. All you have to create is an XML files with your commands. want to write some .net code then how can I do that. The thing I liked most is that this Unit Test framework is based on xUnit. happy to listen to this news. To keep ease in consideratino, a GUI has been added to create Unit Tests. 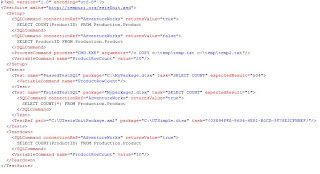 I am copying a sample XML used for this framework from codeplex. don't expect it to be all bug free. You would be glad to know that the utility is available as .